Comics In 5 Panels: Cartoon Month: Totally Spies. You know, I realized from an early age that I was never going to become the next Chuck Norris. One of my favorite toys as a little kid was a Polly Pocket-ish town. The first manga I read was NOT Dragon Ball, but DN Angel. Even the girls in my class made fun of me! 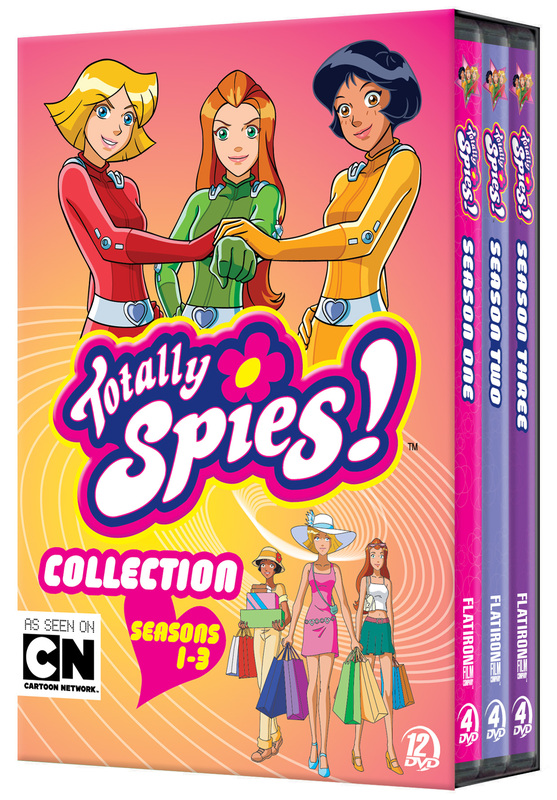 Totally Spies follows the adventures of Sam, Alex and Clover, three best friends and teenage girls. But when they aren't in school or shopping, they work as agents for the secret agency WOOHP(World Organization Of Human Protection), saving the world from evil masterminds of all sorts, like evil women wrestlers, rockstar managers, time-traveling disco dancers or cheerleader coaches. But in a awesome way! The show usually has the girls doing a mission that is linked to a personal problem that they are going through in their school life most of the time. In this sense, the show is kind of repetitive in that regard, even if the normal lfe part of the plot is a bit weak. The villains are stupid as in Silver-Age-comic stupid, and their reason to join the dark side is as silly as well. But the show IS a ton of fun, to be honest. If anything as a guilty pleasure. The girls are a pretty stable group with Sam as the smart and mature one, Alex as the childish sporty one, an Clover... Clover is pretty much a valley girl, which makes her seem kinda out of lace here. But the show wouldn't have been the same without her, really. But actually, it wasn't so much the girl that interested me, but their boss; Jerry. Jerry is the British guy all spy-themed movies/TV-shows need. At first, he does not seem that important to the plot besides telling the girls what to do and providing them with gadgets. But as the shows go on, he starts to grow on us, and he even helps out the girls on their missions. Jerry was once a field agent as well, and he can still hold his on in a fight. One of the best episodes is the one where the girls and Jerry has to fight Terrence, Jerry's evil twin-brother. I can't really recommend this show, unless you want a nostalgic blast from the past, or if you, like me, enjoy watching silly cartoons that you can't take serious at all. That's all for now. Next time, I will take a look at a show a bit more... barbaric. Na, Sam is the redhead in green. Alex is the one in yellow. Anyway, the character designs are pretty neat. I liked this Alex gal. Can't say I was a big fan of the animation work though.